On Saturday Katie Fox and I (The Quick Red Fox) went on a little adventure to the Manchester based dance festival Parklife. Parklife Weekender* is an annual independent music festival that started two years ago at Platt Fields Park and has since relocated to Heaton Park following the festival's increasing popularity and exposure. In the past the festival has played host to bands such as Dizzee Rascal and Disclosure, but this year it was the notorious Snoop Doggs chance to wow the crowds as the main stage headline act. As Katie and I arrived at the festival, we were greeted by torrential rain and lots of muddy festival goers. Despite the heavy downpours, many people remained in high spirits and according to media repots, the festival did not stop people attending as it is estimated that the festival had more than 60,000 guests yesterday alone. Katie and I are both avid fashion and lifestyle bloggers and were lucky enough to be invited to the festival as members of the press. It was the first time I have reported from a festival and boy it was fun. I have been going to concerts since I was a mere 13 years old and I love the sound of loud, live music. Admittedly I'm a little bit more into my rock'n'roll than my dance tunes, but as long as it has a good beat and allows me to dance, I'm generally happy. As far as festivals go, I've only ever been to Download, but I have always wanted to expand my musical horizons. Download usually has all the music I adore in one roof and it has been my festival go to for the last five years, but this year I wanted something different. As I've grown older, my music taste has developed into such an eclectic mix. When I saw that Rudimental were playing at Parklife, I knew I had to be there. The majority of artists I wanted to see at Parklife were on yesterdays main stage. I've become a little bit obsessed with Rudimental lately, as mentioned previously and I couldn't wait to see the trendy, quirky singer that is Katy B. Whilst having a gander at the lineup, I was drawn to seeing Annie Mac because I occasionally listen to her on Radio 1 and when it came to Snoop Dogg, although I'm not the biggest fan, it would have been silly of me to pass up the opportunity to see one of the legendary rap artists of our time. The first thing Katie and I did was check out all the tents and the VIP areas. The VIP area of Parklife was available for those with either a VIP ticket or press pass. VIP tickets were only £20 more than a standard admission ticket and due to this, the VIP gardens were incredibly popular with Parklife fans. Being a Parklife VIP enabled festival goers to use slightly more sanitary restrooms, purchase cocktails as well as standard alcohol and there was a variety of sheltered seating and picnic tables available. After having a rest and sipping on a delightful Strawberry Daiquiri, Katie and I made use of our press passes by heading backstage. If there was one downside to Parklife besides the rain, it would be the lack of directions available. Katie and I regularly got lost. It took use quite sometime to get used to our soggy little map we carried around with us and even then, we mainly asked for directions. 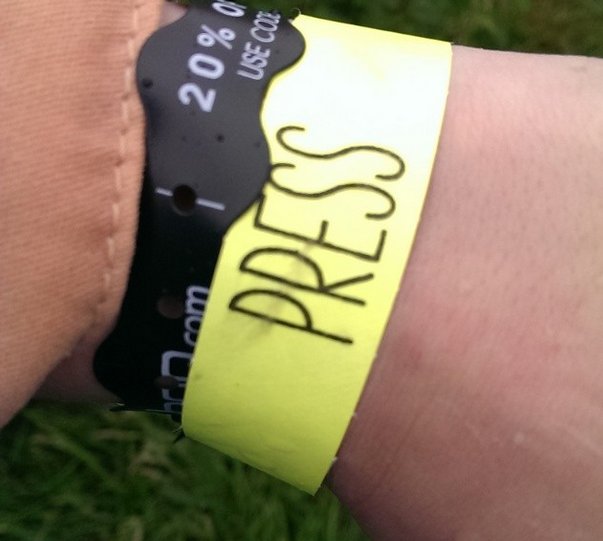 Wearing incredibly muddy boots with a face full of smudged eyeliner and having the most knotty, wet hair I can understand why security had doubts that I was a journalist, however my bright yellow wristband enabled me access to one of my favourite moments of Parklife festival, which ironically is none music related. Hiding backstage at Parklife festival was a TIGI portable salon that offered hair and beauty treatments to the press. Stumbling across this little salon was mine and Katie's saviour. After a morning of trudging through mud and being constantly poured on, it was a delight to sit back and be pampered. TIGI products have always been a firm favourite of mine when it comes to haircare. After working in a salon for two years, they became products I relied on to achieve the best look for my clients. I can close my eyes and vividly remember the scent of Bedhead products lingering around the salon, in particular the Dumb Blond Smoothing Stuff that smells like bubblegum. The stylist at Parklife gave me a volumised curl look using some of my favourite products and introduced me to one of their newer products, "Oh Be hive" which I can't wait to buy. Back to the music, the first artist I saw at Parklife was Katy B. I have had a soft spot for Katy B ever since her most popular hit 'Lights On' came into the charts. Her albums are full of foot tapping, hand raising dance beats that can get even the most anti social dancer on the dance floor and yesterday she drew a large crowd that lingered on her every word. 'Crying for No Reason' was my favourite song that she performed as it evoked a strong sense of emotion and had everyone in the vicinity swaying, singing and even the odd person shedding a few tears. The next artist I saw was Annie Mac and the popular radio 1 DJ gave us a fab performance of her DJing skills. Unfortunately the show wasn't really to my taste as I prefer more visual performances, but I can understand why the crowd liked her and it won't stop me listening to her radio show. Next to play was my favourite band of the evening Rudimental. Rudimental had the crowd going wild and delivered a faultless performance and even when their sound system suffered from a glitch, they continued performing and came back on stage with the most appropriate song 'Not Giving Up.' I loved the sound of the live brass instruments, the various vocalists and watching DJ Locksmith wow the crowd with his humour. The final act of the evening was Snoop Dogg. If you told me last year that I would attend a festival, watch a rap artist and enjoy the entire set, I would have laughed. Snoop Dogg has never really been on my musical bucket list. When I saw that Snoop Dogg was the headline act, I wasn't entirely impressed however I would have felt stupid not seeing one of the most highly debated artists of the last several decades. On the night, Snoop Dogg wowed me. He had the crowd gripped to his every word and came across as highly motivated and passionate about his music. Snoop Doggs tribute to Tu Pac made the crowd cheer with homage and ending with Bob Marley was Snoop Doggs tribute to Rastafarian movement. It was Rudimental that stole the evening for me musically, but I know having the pleasure to see a musical icon such as Snoop Dogg will be a moment that I will always remember. Parklife had its up and downs. The rain and the initial disorganisation gave us a pretty bad start to the festival, but once the evening had ended both of us wanted to experience it all over again. For a smaller independent music festival Parklife delivered with their acts and from what I have been told by other attendees, everyone seemed to enjoy it. I'm not entirely sure whether I will attend Parklife in the future as I've said previously not all the music is to my taste, however the festival has opened my eyes to new acts, a different type of festival and gave me a brand new festival best friend Katie, who made the day the most enjoyable experience. You look festival fabulous, I love your outfit! You're very lucky!! Wow you are so lucky, I wish I got to spend my weekend at a festival :). Looked like you all had a amazing time, i bet seeing snoop was amazing, i have been a fan since he first began and currently am waiting for his new song with Psy ha ha. So nice post thanks for sharing this article i really enjoy your post! safety management course in chennai|Industrial safety training institute in chennai |fire and safety course in chennai|Iosh course in chennai|nebosh course in chennai keep posting. So beautiful moment your so pretty very nice hair style lovely . fire and safety course in chennai this is perfect for your style. Enjoy the weekend festival its wonderful place to party is so pretty i like very much this is very enjoyable party your so lucky! fire fighting training courses in chennai||fire fighting training|| fire fighting course||nebosh igc training in chennai||nebosh safety course in India keep posting thanks for sharing. Very nice place to visiting this places so pretty ! fire and safety courses in Chennai |safety courses in Chennai |safety officer courses in Chennai nice post! Its very nice party i really enjoy your blog! your so pretty and colorful function! Best fire and safety training institute in India|Nebosh Courses in Tamil Nadu| safety diploma courses in india|Industrial safety course in chennai| fire and safety management course training india|Iosh ms course training in chennai its wonderful moment i thanks for you lovely memories !!!. I liked palace its very nice. thanks for sharing the post.nebosh training institute in chennai|nebosh safety course in India|Industrial safety management course in Chennai| fire and safety course in tamilnadu |iosh ms course fees in chennai.